Play fast paced rounds of match-3 to earn prizes, complete missions, and discover new emojis. 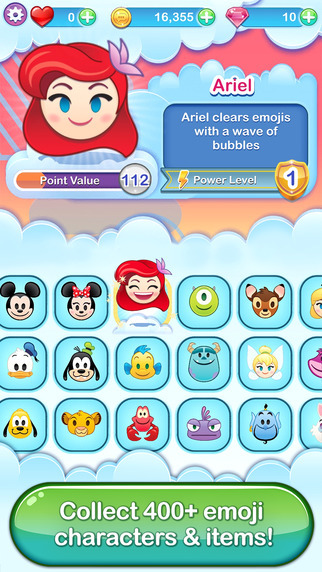 Collect Disney and Pixar emoji characters and items from The Little Mermaid, The Lion King, Cinderella, Zootopia, The Muppets, Disney|Pixar's Toy Story, Monsters, Inc., Finding Dory and more! Before you download this app, please consider that this app includes advertising, some of which may be targeted to your interests. You may choose to control targeted advertising within our applications by using your mobile device settings (for example, by re-setting your devices advertising identifier and/or opting out of interest based ads). This game is awesome! This game gives you a wonderful mix of puzzle games and emojis! I also love the fact that if you want you can use the emojis in your messages!